CLEMSON, SC – The Clemson men’s tennis team will play at fourth-ranked Georgia in Athens, GA on Saturday at 1:00 p.m. The match will be played at the Lindsey Hopkins Indoor Tennis center on the Georgia campus. Clemson is coming off a 4-3 win over a very tough College of Charleston team. 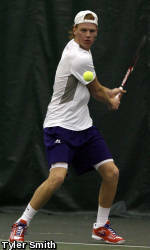 Freshman Cedric Willems clinched the victory with his win at number six singles in the deciding match. The Tigers are ranked 66th in the latest ITA rankings. The Tigers’ Yannick Maden is ranked 59th in the latest singles rankings. Georgia is ranked #4 in the nation. The Bulldogs are led by third-ranked Will Spencer and tenth-ranked Sadio Doumbia, who was a former teammate of Clemson’s Ayrton Wibowo at Auburn-Montgomery. This will be the 61st meeting between the two teams on the tennis courts. The Bulldogs lead the series 47-13. The two teams first met in 1937.